right bite size” authentic French eclairs made with all-natural ingredients, that are also low- calorie for everyday indulgence. And, these new Mini Eclairs come in a variety of flavors. Consider Bonchou the antidote to the boring eclair of the past: the HIP eclair. Created by Hala Achkar, a passionate entrepreneur who has dedicated her life to food, restaurants and hospitality industries, her philosophy is reflected in Bonchou Mini Eclairs: Life is short, and a day without a little burst of joy is a day wasted. Eclairs are edible joy! And, even better, they can be enjoyed guilt-free. At just 70 calories and 4g of sugar each, consumers can treat themselves to a Bonchou Mini Eclair every day – mid morning coffee break, dessert after lunch, mid afternoon pick me up, after dinner light sweet or late evening by the fire treat. The Bonchou motto: an eclair is no longer something just for special occasions or a splurge. Bonchou Eclairerie Mini Eclairs are available in six flavors: Chocolate, Coffee, Salted Caramel and three newest flavors: peanut butter, coconut and sesame butter (Halva) which is only available on Amazon.com. The recipe is authentic Parisian; in fact it belonged to Hala’s grandfather and has been passed down for U.S. consumers to enjoy real French eclairs. 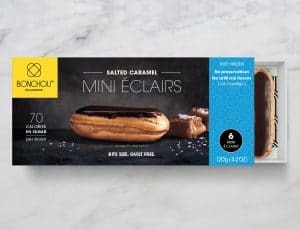 The Mini Eclair comes six to a box, ready to eat, fresh frozen with a 14 month shelf life, to preserve freshness and maintain form during shipping, and are easily thawed individually to be consumed as desired. Bite-sized and low calorie doesn’t mean sacrificing taste though. Consumers still demand an authentic experience, which lines up with Bonchou Eclairerie’s commitment. These Mini Eclairs are made with real French butter, hormone-free milk, cage-free eggs, cane sugar and rich 72% Belgian bittersweet chocolate. According to a recent Forbes article, the past obsession with macarons, cupcakes and Whoopie pies has been replaced by a uptick in consumer demand for eclairs. Enjoying a resurgence at the chic patisseries in Paris, the trend to eclairs has made its way across the pond. The suggested retail price is $8.99, and the eclairs are available in select grocery and natural foods stores as well as on Amazon.com. For more information, visit www.bonchou.com or call 917/963-3605. Chicest Foods, Inc., is a Manhattan-based company that launched Bonchou Eclairerie in the U.S. in 2017. Culinary entrepreneur Hala Achkar has a vision to not only bring authentic French eclairs to U.S. consumers, but to help dispel the myth that eclairs must be high fat and calorie and only for special occasions. In addition, her passion is around creating desserts that delight, inspire and create “lightning moments” in the everyday lives of consumers.